I remember well in 1980 when the actor Richard Gere made Gravity Boots famous in the movie American Gigolo. What most people do not realize is, that movie kick started a movement away from Low Angle Inversion and toward radical Upside Down and High Angle Inversion. The history of seeking relief from gravity goes back to ancient times. There are reports from around 400 B.C. of Hippocrates observing people being lashed to ladders that were then hung upside down; presumably the “patients” were volunteers. Similarly, if you review ancient yoga texts you find the records of various recommended inversion postures from the Shoulder Stand (Sarvang-Asana) to Standing on your Head (Sirsha-Asana). There are similar accounts from the European Middle Ages where they used a system called the Scamnum (Bench of) Hippocrates which was a device that used pulleys to facilitate inverted traction. Fast forward to the early part of the 1900s and you start to find numerous patented products that were supposedly going to help one escape the compressive effects of gravity. Some doctors became locally or regionally famous for advocating low angle slanting along with their other programs of diet or self-care. There have been a fair number of interesting inventions along the way which tried to make Low Angle Inversion more convenient (we will come back to this idea in a minute). One such attempt included a 1961 invention which converted a non-padded ironing board into a slanting board (ouch). Along the way there were attempts to merge the idea of Low Angle Inversion with exercising. One emphasized what we today recognize as yoga postures, but on a slanted position. These units were so hard and made of such smooth material that only a very small person who wore sticky clothing could be on one, otherwise you would slip off of it. These early devices also appeared in the movies. There is a scene in the 1973 movie The Last of Sheila with James Mason and Raquel Welch where, in a brief scene, you can see one being brought aboard a yacht and being set up for one of the actor’s use. There were a few common themes about the devices that were available in this period. Although they were all lower angle inversion approaches, for most people they were uncomfortable to lay on and there was no instruction on how to get OFF of the unit once you were on it. But in a real sense they paved the way for Gravity Pal and our renaissance of Low Angle Inversion. Their omissions are what we have worked on to correct. For example, Gravity Pal inversion tables provide a very comfortable experience and we emphasize how to exit your session for maximum results. We also modified their linking low angle inversion to exercise. They taught you to exercise on the device. While we see many benefits to stretching while on a Gravity Pal, we emphasize using Gravity Pal after vigorous exercise – for exercise recovery, natural compression relief and rejuvenation for the entire physiology. The early era of Low Angle Inversion practically ended and veered off into Radical Upside Down High Angle Inversion largely because of the work of Dr. Robert M. Martin, M.D., a Physician and Surgeon of Pasadena, California who wrote the book, The Gravity Guiding System in 1975. He believed that using gymnastics, which included radical upside down inversion using his Gravity Boots, resulted in a “veritable fountain of youth for all ages of suffering humanity”. His comments are not to be quickly dismissed or taken lightly because, apparently, he produced positive results for many people. However, a person had to commit to a serious regimen of exercise and you had to already have a advanced state of fitness in order to even get started with his approach. This, for many people of average, modest or marginal fitness, rendered his approach impractical and out of reach. The more we researched his, and other older attempts to get relief from Gravity, the more we recognized a pattern. Those who were less physically fit were being left out. 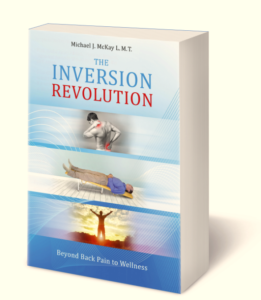 Inversion, and in particular LOW Angle Inversion, can – and should – be used by many who are NOT in the best physical shape. Furthermore, it should be a gentle approach that is accessible to virtually everyone. The Era of Low Angle Inversion with Gravity Pal Arrives! Gravity Pal inversion tables represent a new, and much improved way, to achieve natural compression relief from the relentless influence of gravity on our human bodies. But the cumulative effects provide much more than compression relief, impacting our entire circulatory systems and even affecting our appearance. LOW Angle Inversion with Gravity Pal activates blood flow to the brain and – importantly – activates the body’s secondary circulation system – the Lymph System – in the brain as well. It is generally known by non-medically trained people that the Blood System brings oxygen and nutrients to the cells as well as carries away smaller impurities for elimination. However, it is not as commonly understood by most people that the Lymph System helps the body to eliminate larger molecule waste products. The problem with the Lymph System is that it is passive, it does not have a massive pump, like our hearts, to activate it. Instead it relies on our moving the body and if we are less active or sedentary it does not do its job as well. We asked the question: Can we effectively and meaningfully activate the lymph by properly using gravity while someone lies resting? Researchers are now looking at the Lymph System and how it’s large molecule waste removal mechanism is connected to several diseases. There are exciting, new scientific studies – one released in June 2015 (please see link below , or read here) – which discovered that the Lymph System permeates the brain much more than had previously believed. This may have new, profound, implications in the treatment of a number of diseases including, Autism, Alzheimer’s disease and Multiple Sclerosis. One of the researchers, Dr. Kipnis of the University of Virginia, stated that, “we can now approach [these diseases] mechanistically”. An obvious “mechanistic” method would be to use Low Angle Inversion to increase lymph flow throughout the brain. You can also read more about this on our “Invitation to Researchers” page. And, finally, some people are attracted to Low Angle Inversion with Gravity Pal simply for vanity reasons. Many people notice that their skin appears to be more healthy and the collagen in their face becomes more firm, thus improving their appearance. THIS is what was missing up until now! Now, with Gravity Pal we can “Make Gravity Our Friend” and enjoy Natural Compression Relief Solutions.